Governor Brown Signs Major Step Towards Citizen-Funded Elections! SACRAMENTO — Today, Governor Jerry Brown signed a bill giving all Californian jurisdictions the right to give their citizens a bigger voice in democracy by changing the way election campaigns are financed. SB 1107 amends California's antiquated ban on public financing of campaigns to allow local governments and the state to pass their own systems for citizen funding of election campaigns to magnify the voices of small donors and everyday voters. SB 1107 was authored by Senator Ben Allen and coauthored by Senator Loni Hancock and Assemblymembers David Chiu and Lorena Gonzalez. Sponsored by the California Clean Money Campaign and California Common Cause, SB 1107 allows public financing of campaigns in California elections if they're paid for by dedicated campaign finance trust funds and are "available to all qualified, voluntarily participating candidates for the same office without regard to incumbency or political party preference". "Californians are demanding greater accountability from their elected officials, and rightfully so. Anything we can do to empower communities to reduce the influence of money in campaigns is a good thing", said Senator Ben Allen, author of SB 1107. SB 1107 passed the legislature with bipartisan support. Republican Senators Anthony Canella (R-Ceres) and Bob Huff (R-Brea) and Assemblymembers Catharine Baker (R-San Ramon), Ling Ling Chang (R-Brea), and David Hadley (R-Torrance) all deserve great credit for standing up for the voices of regular voters against special interests, as do all the Democrats who voted Yes. Senate President pro Tem Kevin de Leon (D-Los Angeles), Senator Robert Hertzberg (D-Van Nuys), Assembly Speaker Anthony Rendon (D-Los Angeles) and SB 1107's author Senator Allen (D-Redondo Beach) and Assembly floor manager Lorena Gonzalez (D-San Diego) also deserve special commendation for their leadership in passing SB 1107. "The undue influence of big money special interests in politics isn't a partisan issue," said Assemblymember David Hadley (R-Torrance), one of the key votes in SB 1107 achieving its needed 2/3 majority in the Assembly. 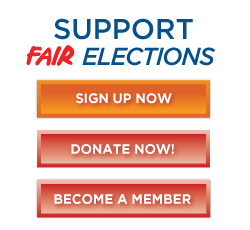 "I voted for SB 1107 to give cities and counties the local control they need to develop campaign finance systems that work for them, and look forward to working with the California Clean Money Campaign and others to explore carefully-crafted citizens-funded election systems to strengthen election accountability." "Californians are crying out for reform of our broken campaign finance system, as shown by the tremendous outpouring of support for SB 1107," said Trent Lange, President of the California Clean Money Campaign, co-sponsor of SB 1107. "We're very grateful to Governor Brown and the bipartisan legislative leaders who made its passage possible so that Californians can explore citizen funded elections systems that give regular voters a stronger voice against big money special interests".